Created for children between four and six years of age, the Italtrike Pilot 300 School Bus Trike lets children be the drivers for adventure! 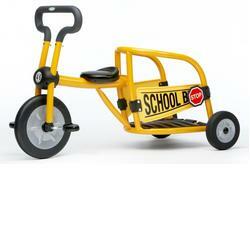 With its fun school bus theme, two kids can take part in the fun as one pedals and the other sits in back. Its molded construction means its child-safe, yet durable all the same. Whether used at home, on the playground or at school, this scooter will give children a learning experience filled with fun!